Your eligible deposits with Vanquis Bank Limited are protected up to a total of £85,000 by the Financial Services Compensation Scheme, the UK's deposit protection scheme. Any deposits you hold above the £85,000 limit are not covered. Please click here for further information or visit www.fscs.org.uk. These bonds are a limited offer and may be withdrawn at any time. *AER stands for annual equivalent rate and illustrates the interest rate if interest was paid and compounded once each year. 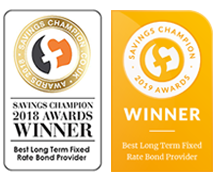 Vanquis Bank Savings has been awarded the Winner of the Best Long Term Fixed Rate Bond Provider category and has been Highly Commended as the Best Fixed Rate Bond Provider in the 2017 Savings Champion Awards.